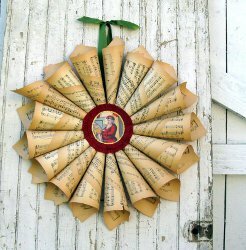 We love the idea of upcycling old pages of sheet music or book leafs. For such a simple DIY the outcome is nothing short of artistic and adorable. And, since you choose your own designs of paper, you can opt to create one for the holidays or everyday hanging. Other needed supplies include tape, glue, cardboard, a dowel and accent fabric or lace. Have a variation of this type of project? We’d love to hear your ideas.